The Iota Delta Chapter of Tau Beta Sigma at the University of West Georgia was chartered on April 25, 2004 by eleven color guard members of UWG's marching band, The Sound that Lights the South. As of Spring 2011, there have been 37 sisters initiated into the Iota Delta chapter. Today, there are eleven active sisters. This April, ten of our sisters were able to attend the Southeast District Convention, hosted by the Kappa Mu Chapter of Kappa Kappa Psi at the University of Georgia in Athens, Georgia. On February 13, 2011, five sisters from the Iota Delta Chapter were able to attend the Southeast District's District Leadership Conference at Florida State University in Tallahassee, Florida. 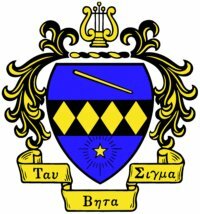 What is Tau Beta Sigma? 1. To promote the existence and welfare of the collegiate bands and to create a respect and appreciation for band activities and achievements among the listening public everywhere. 2. To honor outstanding members of the band through privilege of membership, in the Sisterhood, extended in recognition of musical achievement, demonstrated leadership, and an enthusiastic approach to band activities. 3. To develop leadership through active participation with the band, and through it, to strengthen those traits of conduct, thought, and idealism which characterize the responsible membership of the band. 4. To encourage a close relationship between collegiate bands and promote a high average of attainment by the performance of good music and selection of worthwhile projects. We provide exceptional service to collegiate bands and promote equality and diversity, including empowering women in the band profession. We cultivate leadership, educational achievement, music appreciation and community development. Tau Beta Sigma is a highly respected pre-eminent music organization comprised of over 160 collegiate chapters and more than 3,800 collegiate members with a balanced representation of women and men. Strong leadership thrives throughout our organization and we have a solid financial foundation. We cultivate and sponsor a variety of music education programs for our diverse membership and work closely with collegiate band directors. Our alumni association is an integral part of Tau Beta Sigma, promoting diversity efforts, social networking and assisting members in enhancing their professional leadership and employment possibilities after graduation from college. We are connected with music in the community which includes supporting music education at all academic levels. In 1937, the first practical idea for establishing an organization for band women was presented to D. O. Wiley, Director of the Texas Tech University Band. Wava Banes, a member of the band, now Wava Banes Henry, along with her classmates, Emily Surell and Rosell Williams, discussed many of the possibilities and requirements necessary for the formation of a National Band Sorority. Their plans and discussions came to fruition in 1939, when a group of women in the Tech Band founded a local organization, known as “Tau Beta Sigma,” modeled both in principle and idealism after Kappa Kappa Psi. Just like the Fraternity, Tau Beta Sigma was designed to serve as an honorary, service, and leadership recognition society which provided special social and educational experiences that were useful to women during the days of the “all male world” of collegiate bands. Unfortunately, just as the group was becoming well established, World War II disrupted future “national” plans. Tau Beta Sigma continued to grow at Tech, taking over key projects within the band program and was greatly responsible for keeping the Tech Band in operation during the war years. In June of 1943, the Tech girls petitioned the Grand Council of Kappa Kappa Psi to become a part of the National Fraternity as an active chapter. Accepting the group under these conditions would have entailed a complete revision of the Fraternity’s constitution, an impossibility under wartime conditions when all Fraternity operations were virtually suspended. Rather than postpone action, it was suggested that Tau Beta Sigma incorporate as its own national organization. While applying for a national charter, the Tech Chapter encountered difficulties involving Texas State corporation laws. In 1945, A. Frank Martin, Executive Secretary of Kappa Kappa Psi, was invited to meet with the women and assist them in designing a plan to gain national status. During the meeting, it was determined fewer obstacles would be encountered by submitting a charter application for the national organization in the State of Oklahoma. In order to establish the national organization, the women of the Texas Tech Tau Beta Sigma Band Sorority surrendered their name, Chapter Constitution, Ritual, and jewelry designs to the band club at Oklahoma State University in January of 1946. And, on March 26, 1946 a charter was granted to Tau Beta Sigma. The Kappa Kappa Psi delegates at the 1947 Fraternity Convention officially voted to accept Tau Beta Sigma as a “sister organization” of the Fraternity and offered this new organization the privilege of sharing all fraternal publications, National Office operations, staff personnel, and other fraternal programs.